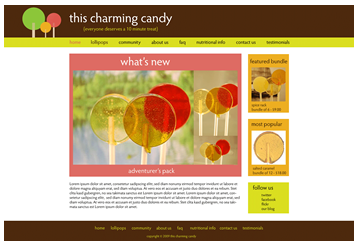 For this project, I worked with five other students in order to create a website template for a new start-up candy company called "This Charming Candy". 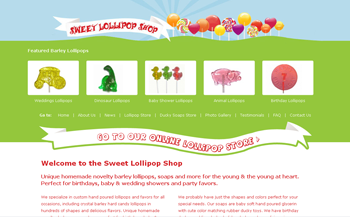 We were to learn and use standard user centered web design development practices to accomplish this taks. This project was a challenge from the beginning as they did not provide any written or graphical content for the website and we were asked to assist with this in addition to the project requirements. We created a project proposal which outlined the project scope,the assumptions and constraints, along with a competative analysis. A user/task analysis matrix was made based on our research, and using that information, three personas were developed. 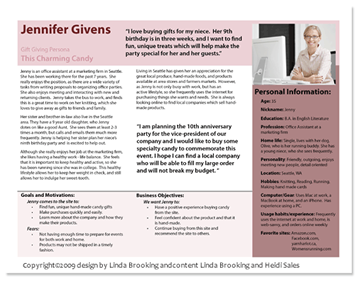 This is the persona I developed with another student. The next step in the project was to prepare a digital card sort, using WebSort. Based on the results of the cardsort, the information architecture of the website was created and a paper prototype developed. Based on the paper prototype, a digital prototype was created and then usability testing was completed using our test scenarios. Finally, the coded template was presented to our clients. We consulted with the company propriators through the entire process and eventually they provided some content including a logo which didn't seem to match with the product or the marketing direction (photos) they choose. 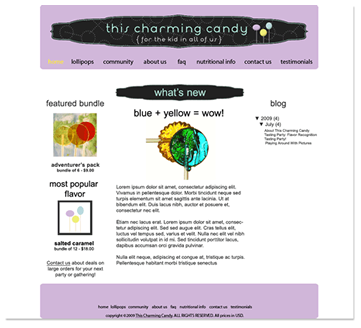 Although they liked the template we created, they choose instead to use a blog and an Etsy.com shop where they had a pre-built shopping cart and did not have maintain a website on their own. I felt that their logo and product colors did not work well together, so I created another version of the homepage design that addressed this issue.